Homeopathy is a distinct philosophy of medicine that has its roots in eighteenth century Germany, and subsequently spread to Europe, India, Australia, South America, the United States, and Canada. "The underlying basis of homeopathy is the principle that 'like cures like'..."
The underlying basis of homeopathy is the principle that 'like cures like', or that a substance that is capable, in toxic doses, of producing a set of symptoms is also capable, in much lower doses, of curing the same set of symptoms regardless of their perceived cause. The founder of modern homeopathy, Samuel Hahnemann, speculated that a homeopathic medicine has a temporary acute effect on the body. As the body rouses to neutralize this effect, similar symptoms from any other cause are likewise neutralized or eliminated. Homeopathic treatment thus involves matching as many symptoms as possible in a patient to the known effects of a remedy. Remedies are derived from substances found in any of the three kingdoms (animal, vegetable, and mineral). Many of the early remedies were already in popular use in eighteenth century medicine. Because patients often showed severe side effects when they received standard doses of medicines, early homeopaths directed their efforts at finding the minimum dose that was still therapeutic. Experimental work showed that a remedy could cause less reaction, yet still effectively treat a patient, when it was serially and systematically diluted and succussed (shaken in a specific manner). By carefully observing patients and recording their symptoms and subsequent response to treatments, homeopaths were able to catalogue and cross-reference the remedies with the symptoms they could treat. At times, homeopathic practitioners would administer placebos to their patients in order to determine whether symptoms and responses were truly due to the effects of the remedy. Additional information was also derived from reports of toxic reactions to various drugs and natural substances. Modern homeopathic practitioners use these reference works, known as repertories, as a basis for determining the correct treatment for an individual case. What is the history of homeopathy in veterinary medicine? Often, early homeopaths treated both human and animal patients, and numerous case reports of treatment in dogs, horses, and cattle have been preserved in the works of these pioneers. "Veterinarians in the nineteenth century used homeopathic texts that were specifically developed for their profession..."
Veterinarians in the nineteenth century used homeopathic texts that were specifically developed for their profession, as well as information from their medical colleagues. In the latter years of the nineteenth century, homeopathy began to decline in popularity with the development of the pharmaceutical industry. Homeopathy has been undergoing resurgence since the middle of the twentieth century, and has become popular again as a form of veterinary medicine in the past twenty to thirty years as animal owners and veterinarians alike explore it as a way beyond the limitations of conventional medicine. Formal training courses are offered to veterinarians and lead to certification status for successful veterinarians. On which species of animals is homeopathy practiced regularly? 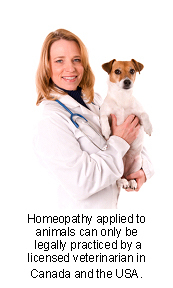 Homeopathy is routinely practiced in dogs, cats, horses, ruminants, and birds. Its use in other exotic species is growing. Who practices veterinary homeopathy and do I need a referral? "Homeopathic first aid for self-limiting conditions, can be readily taught to lay people." Some aspects of homeopathy, such as homeopathic first aid for self-limiting conditions, can be readily taught to lay people. Because of the potential for harm if critical illness or chronic disease is assessed incorrectly, it is absolutely necessary to have veterinary training as well as training in homeopathic theory and practice in order to properly treat animal patients. Both the American Veterinary Medical Association and the Canadian Veterinary Medical Association consider veterinary homeopathy to be the practice of veterinary medicine and, as such, licensed veterinarians in those countries can only legally practice it. As veterinary homeopathy gains acceptance, there are an increasing number of veterinarians in private practice who possess the necessary training and experience. Referrals are available, but not necessary. What conditions are most often treated with homeopathy? Both acute and chronic diseases are amenable to treatment with homeopathy. From the homeopathic perspective, acute diseases are diseases that are caused by external influences, such as injuries, poisonings, infectious diseases, etc. The symptoms that arose in these cases were considered to have an adaptive advantage in that they often resulted in neutralization or elimination of the noxious influence. Samuel Hahnemann later proposed that chronic diseases were also caused by the invasion of an external force, or 'miasm'. To Hahnemann, symptoms that arose in response to this invasion represented the enduring action of this external force on the body. Some modern practitioners consider chronic disease symptoms as merely an initially constructive response to disease that has become enfeebled and ineffective over time. Chronic diseases from the homeopathic perspective include most common disease syndromes such as allergies, arthritis, skin problems, digestive disturbances, respiratory problems, musculoskeletal problems, organ disease, and cancer. How can my pet benefit from homeopathy? Homeopathy is potentially of value in any condition, regardless of prognosis from a conventional medical perspective. Some individuals may not be amenable to treatment with homeopathy, and experience little or no improvement despite the practitioner's best efforts. "Homeopathy has a reputation of demanding a very high degree of skill from the practitioner." Homeopathy has a reputation of demanding a very high degree of skill from the practitioner. If properly applied, homeopathy may eliminate the need for surgery in certain conditions, or may eliminate the need for chronic medications. Homeopathy has been credited with saving countless lives during epidemics of dysentery, cholera and typhoid fever in the age before antimicrobials (antibiotics). The success of the treatment of chronic conditions will vary according to the age of the patient, prior treatment history, diagnosis, and the patient's vitality. "As with all other forms of medicine, the earlier in the course of disease that homeopathy is started, the better the response tends to be." As with all other forms of medicine, the earlier in the course of disease that homeopathy is started, the better the response tends to be. Patients considered more difficult to treat include cases that have been previously treated with multiple potent drugs, especially chemotherapy; patients that have undergone long-term therapy with corticosteroids and other immune suppressants; and diseases that can be characterized as a very deeply entrenched form of pathology such as cancer. Although popular books claim that homeopathy is very safe, this is not always the case. Homeopathic remedies should never be administered without a proper veterinary diagnosis. Despite the popularity of telephone consultations among veterinary homeopaths, treatment using homeopathy in a critical illness should be considered to be inappropriate without adequate monitoring and follow-up evaluation by a licensed veterinarian. Homeopathy may produce side effects or a worsening of the initial complaint if the wrong remedy is administered, or if the correct remedy is overused. A partial response to treatment is not necessarily optimal for a patient's health, if other symptoms continue unabated. As with other medical systems, comprehensive improvements are more likely to be associated with a fundamental change for the better. Such partial improvements may be more common when over-the-counter combinations of remedies are used, as opposed to a single more appropriate remedy. 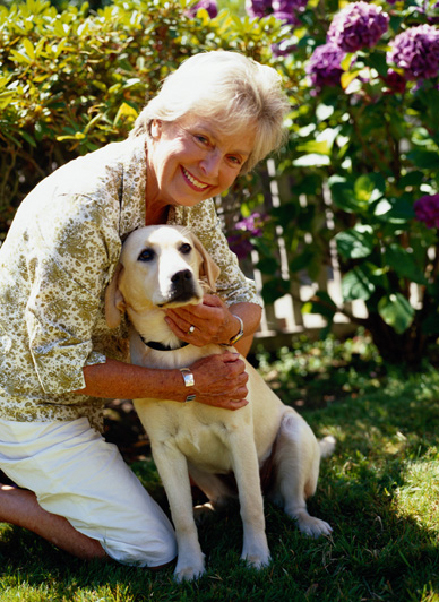 Veterinary homeopaths are trained to use single remedies and correctly interpret symptom changes. When used correctly and by a skilful veterinary practitioner, serious adverse reactions to homeopathic remedies are uncommon, but may occur. When the correct homeopathic remedy has been administered, it is common to see a mild worsening of the condition, called an 'aggravation'. Such aggravations should resolve within a short period of time once treatment is at least temporarily discontinued. What is the cost of homeopathy? Homeopathic remedies are generally very affordable. However, comprehensive homeopathic treatment can be very time consuming, since it involves a thorough history taking and physical examination, followed by a patient assessment, case analysis and formulation of a treatment plan, including remedy prescription. "...costs will vary according to the specific condition being treated, the time spent on the case, and the response of the patient..."
It rarely involves a single visit, and costs will vary according to the specific condition being treated, the time spent on the case, and the response of the patient, which dictates how many follow-up appointments are required. The fees associated with homeopathic treatment are set by the individual practitioner, and will often reflect the skill, experience and training of the practitioner. 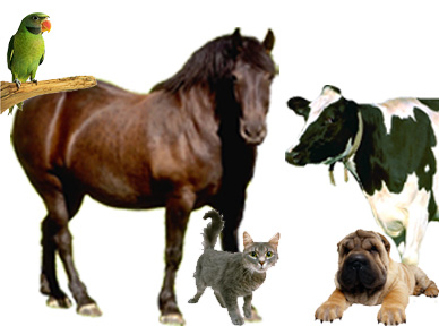 Can homeopathy be combined with other types of veterinary medicine? Homeopathy is useful as an adjunct therapy to manage post-operative pain and to speed healing after injuries. However, as a complete and well-developed system of medicine, homeopathy is effective as the sole form of treatment for most conditions, and is used that way by skilled practitioners. Under certain circumstances, it can be combined with other forms of treatment. Caution must be used when mixing homeopathy with some drugs, or with other forms of complementary or alternative veterinary medicine. "Pungent ointments, strong smelling chemicals such as camphor and tea tree oil, and any strong stimulant medications may interfere with homeopathic treatment." Pungent ointments, strong smelling chemicals such as camphor and tea tree oil, and any strong stimulant medications may interfere with homeopathic treatment. Combining therapies can make if difficult to determine what is working well, or whether the different treatments are interfering or nullifying each other. 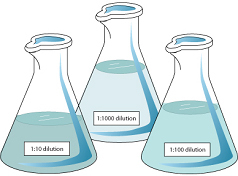 Ideally, when two or more forms of treatment are given, they should be separated by one or two days or by at least several hours if a longer interval is not possible. Certified veterinary homeopaths have the knowledge and skill to understand the interactions between different forms of treatment and to interpret the patient's response to therapy. If your pet is receiving homeopathic treatment from a practitioner other than your regular veterinarian, it is imperative that both individuals are kept updated about the ongoing treatment in order to provide coordinated care of your pet, to allow proper evaluation of treatment and to minimize any avoidable interactions or interferences. How can I find out more information about veterinary homeopathy? The most efficient way to find current reference materials, links, and referral lists is to consult the Alternative Veterinary Medicine website at www.altvetmed.org, or the American Holistic Veterinary Medical Association website at www.ahvma.org.